Click the link to see some fantastic pics. 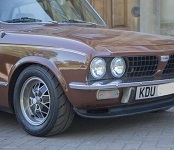 When Simon Drabble came across this Triumph Dolomite, he fell in love with it and knew he had to have it. Once you learn of its history, you’ll understand the attraction. It has been a race car since day one, having been supplied by the British Leyland Competitions Department to Julian Verneave, the sales agent for BL in Belgium, from new. The car originally ran in the yellow Butch Taylors livery, and you can still see some of that paint where the white has chipped off. In 1976, though, BL asked Verneave to run in works colours, and that’s the livery it has had ever since. It also still runs the development engine that was fitted in 1976. “For a Dolomite, that’s remarkable,” says Simon. The car was raced at the Spa 24-hour every year from 1974 to 1977, and its motorsport career in period was in the Benelux region (with, it’s thought, some appearances in Germany). Verneave kept the car right up to 1990, when ill health prompted him to sell it. Simon went to meet him last year, and discovered that he still regrets that decision. “He said he was gutted because if he’d known he would have recovered he never would have sold it,” says Simon. It has passed through very few hands since. Barry Siddery-Smith was the second owner, and he put it in a museum. It then went to Anthony Robinson, who raced it at Goodwood a few times, before Simon took it on in 2018. It looks as if Simon will be another long-term custodian. “I’m not very good at selling cars which is ironic given that I am a car trader. When it comes to my own cars I keep them way too long. This is a keeper, I love it. It’s great to have a car with such history. You can make any car look nice and you can make any car go fast. This isn’t the fastest car on the circuit at all but it has such a lovely history. To go and meet the owner who raced it in period is a real privilege." As it transpired, they also finished the race in the position someone has to come, but that doesn’t detract one bit from what a special car this Dolomite it. In that repsect, it perfectly sums up what the Members’ Meeting is all about.